In an eye-opening book that Booklist praised as “impressively documented, essential Civil War reading,” historian David Williams lays bare the myth of a united confederacy, revealing that the South was in fact fighting two civil wars—an external one that we know so much about and an internal one about which there is scant literature and virtually no public awareness. 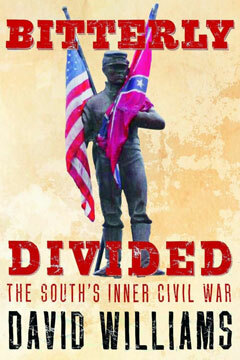 Bitterly Divided skillfully shows that from the Confederacy’s very beginnings white Southerners were as likely to have opposed secession as supported it, and they undermined the Confederate war effort at nearly every turn. In just one of many telling examples in this rich and surprising narrative history, Williams shows that when planters grew too much cotton and tobacco and exempted themselves from the draft, plain folk called the conflict a “rich man’s war” and rioted. Many formed armed anti-Confederate bands. Southern blacks, in what W.E.B. Du Bois called “a general strike against the Confederacy,” resisted in increasingly overt ways, escaped by the thousands, and forced a change in the war’s direction that led to emancipation. This immensely readable and riveting new analysis takes on the Confederacy’s popular image and reveals it to be, like the Confederacy itself, a fatally fractured edifice.